Our 0-3 Infant Program aims to provide parents with the opportunity to engage with their child in a calm, nurturing Montessori environment. 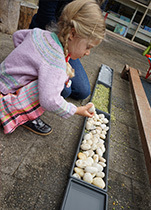 Nurture the interests, curiosity and developmental needs of children 0-3 years of age. Provide stimulating, hands-on and practical activities that develop skills of independence while engaging with others in a caring environment. We utilise a combination of specialised Montessori equipment and activities adapted to the principles of Montessori education. 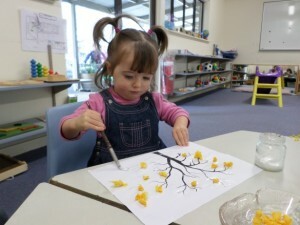 Lay the foundations of future learning by developing a broad range of skills to foster independence, self-discipline and concentration while also educating the senses (e.g. visual, auditory, tactile). Support parents in understanding the developmental needs of their young children. Engage parents in furthering their understanding of Montessori Education, its philosophy and application. Our Preschool Transition Program aims to familiarise parents and their child with the environment, work habits and routines of the Pre-school. om that which has been offered in the Infant Program, and catering for their developmental needs. A structure and routine that mirrors those of the Preschool classroom. An opportunity for independence to be fostered in a supported caring environment. Opportunities for Transition children and parents to visit the Preschool and familiarise themselves with the classroom, routines and staff. An environment where the ‘spark of learning’ can be fostered. Support for parents in understanding and catering for the developmental needs of their child and the Montessori philosophy and methodology. Bookings for Open Day tours are essential, please call 08 8339 6842 or complete a request online.